PureNet architected a complete ecommerce solution including B2C, B2B, integration and fulfilment logic for the globally loved doughnut brand, Krispy Kreme. 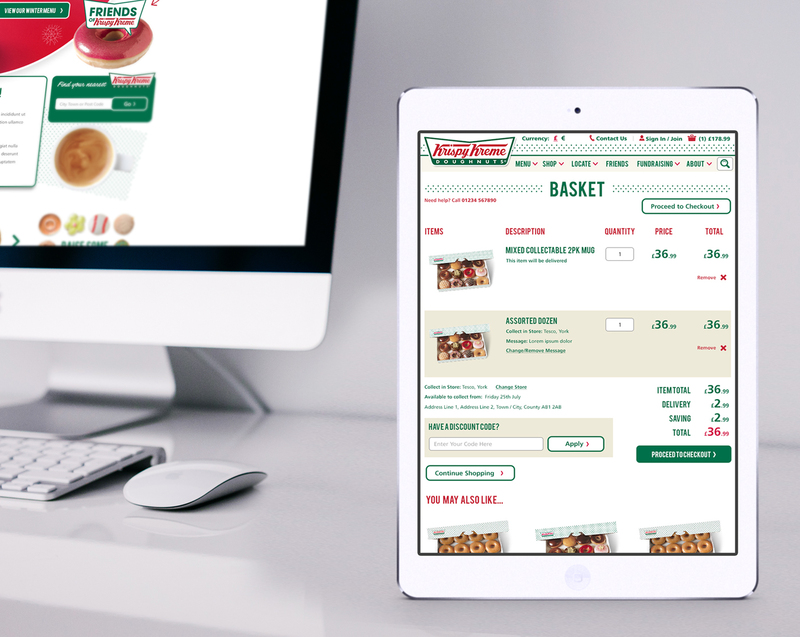 Krispy Kreme needed to establish an effective UK web presence to project its brand, provide an ecommerce outlet for its range of branded gifts and to offer an effective click and collect service for customers. It also needed to provide a B2B and events offering. There needed to be a back-end hub infrastructure to allow click and collect orders to be serviced. The site had to be designed responsively to optimise the experience for desktop, tablet and smartphone users alike. In addition, Krispy Kreme required a separate Careers website to be integrated and engaging. PureNet architected a solution that met Krispy Kreme’s requirements. This included planning in minute detail including full wireframes of the solution. At the front end, the solution offers the ability to click and collect doughnuts based on users’ postcodes, buy its gift ranges of mugs, cufflinks, key rings and other exciting merchandise. Weddings and other events can be catered for including the famous Krispy Kreme Doughnut Towers which are also available to order. Businesses can use the system to order personalised, branded boxes and box sleeves for corporate events. Fundraising events are also catered for to provide discounted doughnuts. At the back end of the solution, there is complex functionality around the fulfilment of the orders as they are booked in via distribution points or ‘hubs’. The PureNet system is then updated as part of the supply chain process ensuring doughnuts are available for collection and delivery. Shared baskets are also supported. Krispy Kreme now has a cutting edge website capable of meeting its business objectives. The system meets the needs of its target audiences for everyday lovers of Krispy Kreme treats to wedding parties and corporate events. The site is now planning its phase 2 roll-out to capitalise on its success. More doughnuts! Krispy Kreme's new solution has lead to a huge increase in conversion rate. The new, seamlessly integrated solution, has directly increase revenue generated. 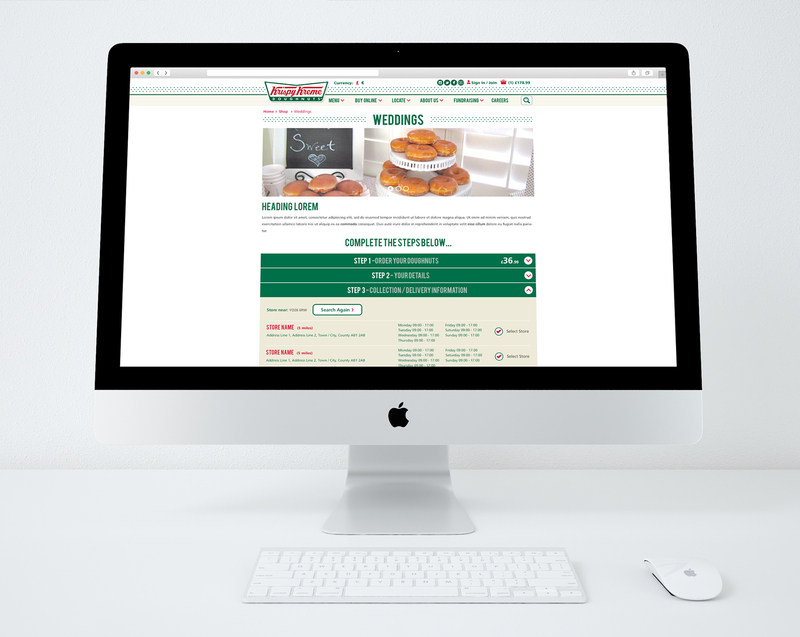 Krispy Kreme is now an online destination, with an increase in regular visitors who engage with the brand online. The responsive design and UX has led to a significant increase in revenue via mobile devices. Looking for a World-Famous Ecommerce Solution?